Visiting with the Alsops, your humble narrator finds fancy in the notion that he is sitting in a place which is theoretically unique upon this earth. 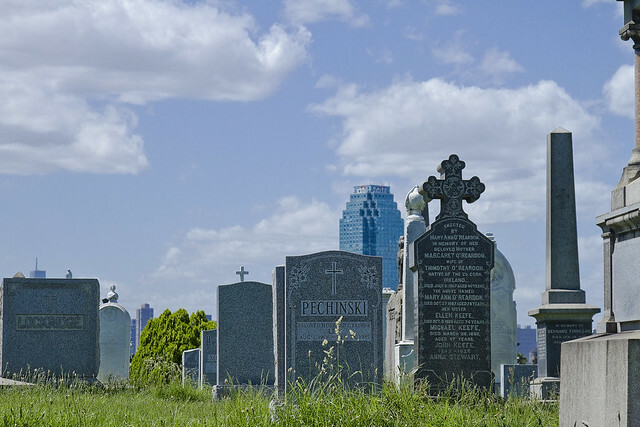 A Protestant graveyard which dates back to the days of the Dutch colonial decadence, The Alsop plot is entirely enveloped by the coils of First Calvary Cemetery, which is a Catholic institution. Modern minds forgot the fires of the Reformation, wherein our modern world of the west was forged, but such mingling of creeds still draws ire and derision from the faithful. While in Calvary, and when the light is right, one makes an effort to photograph these centuried stone markers. Lost in my pursuits, sudden realization that I wasn’t alone washed over. One of the famed Groundling Burrowers appeared. 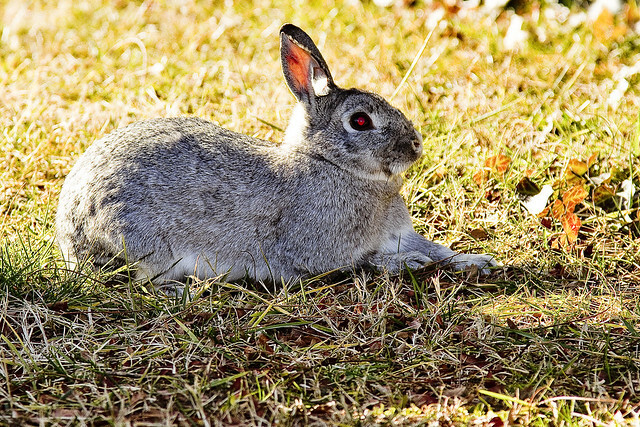 The Lagomorphs are famed as messengers between the underworld and our own, and often have I consulted with this oracular population that exists within Laurel Hill. No question burned in my mind, as before, and I wondered what it had come to tell me. Stoic, the beast gave no indication. It fixed me with an unblinking glassy stare. A blossom of terror unfolded in me, becoming a yawning maelstrom of chaos- of the sort described by Poe himself- which threatened to consume my very mind and plunge me into that dark blessing which is the ignorance engendered by madness. Monstrous silence crushed down upon me, and this thing which had grown haughty and mature in some subterranean pocket of the cemetery continued to glare. The hidden paths known only to its kind, leading to unguessable sorts of ghoulish destinations and nitre choked cathedrals of sorrow below ground, carry these Groundling Burrowers into contact with that which cannot possibly exist down there and broad is their experience. The beast twitched its ear to the east, and then I drossly noticed what it wanted me to see. 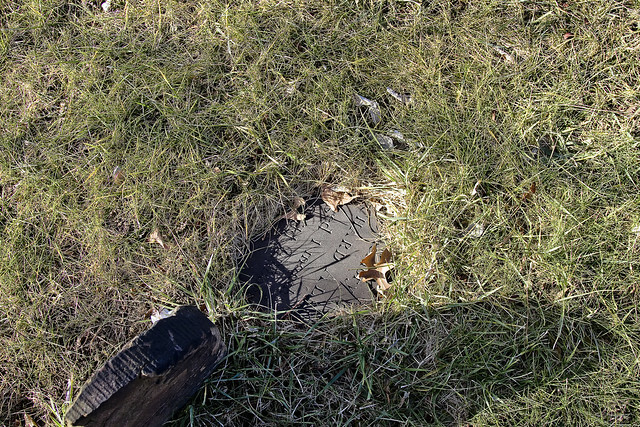 A stone monument, buried except for a small patch of its face. Had the Burrowers purposefully excavated a section, hoping it would be noticed by Grounds Staff or idle passerby? 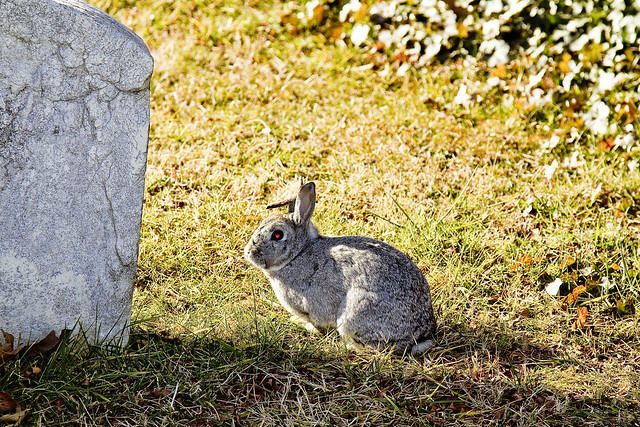 The creature bounded off, disappearing into a thicket of grass following the fence which cordons off the Alsop ground from the larger cemetery surrounding it. The visible section of the exposed monument says Richard Alsop, aged 1 month. The Alsops engaged in an annoying multigenerational habit- the naming all of their male children Richard or Thomas- which confuses me. 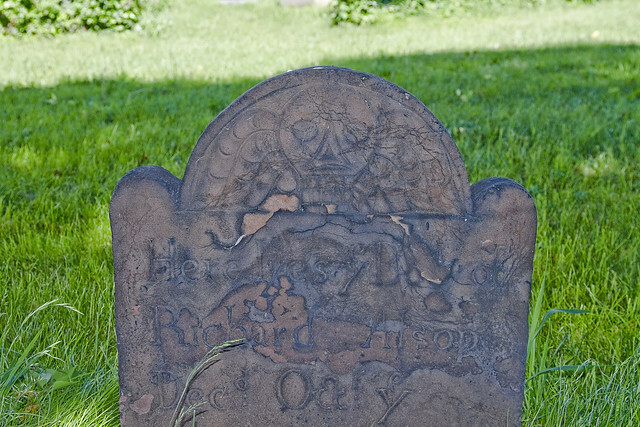 According to the Alsop genealogy folks a Richard Alsop aged 1 month died and was buried here in an interval between seven year old Hannah and a four year old also named Richard- that would correspond to a period sometime between 1772 and 1777. 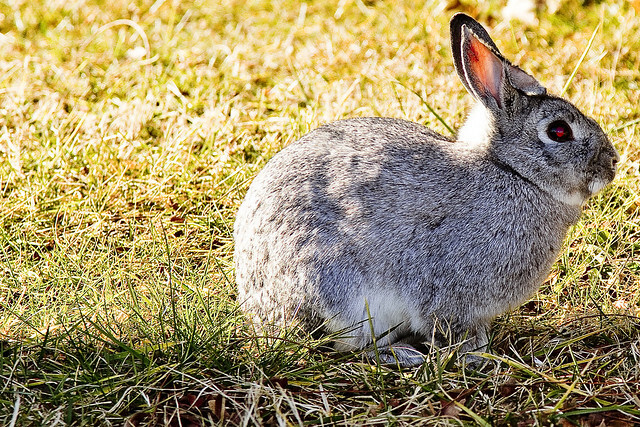 Thanks Mr. Rabbit, you Groundling Burrower you. Remember that event in the fall which got cancelled due to Hurricane Sandy? The “Up the Creek” Magic Lantern Show presented by the Obscura Society NYC is back on at Observatory. Click here or the image below for more information and tickets. The final series of images which were discovered on my camera card, product of a trance like “Grand Walk” which carried me through an ancient corridor of the megalopolis, corroborated my theory that indeed- all roads always have and always will lead to Calvary. Calvary Cemetery hosts the hoary remnants of an ancient clan of Anglo Saxons called the Alsops, who are buried in a family plot maintained as separate and distinct from the necropolis which surrounds it. Protestant land, officially, the earliest grave found here is meant to be the one housing the sire of the line- that of Thomas Wandell, but if there was ever a marker it is long vanished. There are several members and generations of the Alsop family interred here, alongside their unnamed and oft unmentioned African slaves in this hidden corner of the Newtown Pentacle. 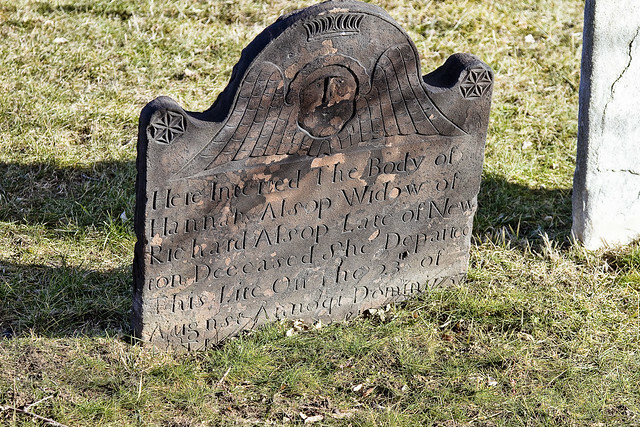 The oldest stone extant is that of Richard Alsop, a crumbling example of the carvers art which dates to 1718. The Alsop farm, on the Queens County shore of the Newtown Creek, was the grave of Thomas Wandell, the former owner of the farm, who died in 1691. A large part of the farm became the site of Calvary Cemetery, but the Alsop family burial ground, by a reservation to the family, still remains Protestant ground. Alsop was quite a fellow by all reports, a very public man who acted as judicial magistrate and executor of inheritances for the simple farmers of Newtown. One of his descendants, John Alsop of Connecticut and Long Island, was a delegate to the Constitutional Conventions which initiated the “American experiment” in the 1770’s and 80’s. The last of the Alsop line in Newtown – also named Richard Alsop- died without heirs, and a vast plantation estate that stretched along the then vernal Newtown Creek was offered up for sale. It found interested buyers in a group of Irishmen hailing from Mulberry Street, across the river in New York, who worked for a large firm headquartered in Rome. Thomas Wandell, Maspeth Kills. 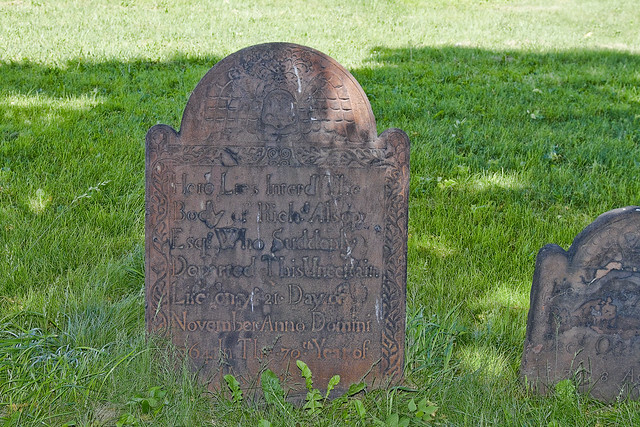 “The last will and Testament of Thomas Wandell of Maspeth Kills in the bounds and limits of Newtown upon Long Island; being subject to sudden sickness and knowing the certainty of death.” Leaves all estate, except the following legacies, to his wife Audry Wandell, and makes her his sole executrix. I leave to my cousin Richard Alsop, the piece of salt meadow that lieth within his fence, that incompasseth his dwelling house. Also 2 steers and a case of pistols already in his possession. Long has your humble narrator desired to look upon the monument of “he who must not be named” and the long journey which carried me here actually began when I was contacted via “electronic mail” by a stranger who claimed to possess first hand information- an actual burial plot address here at Calvary. He described himself as belonging to a faction of the “Ancient Order of Hibernians” which had splintered away from the mainstream group in 1921 over a silly doctrinal dispute. 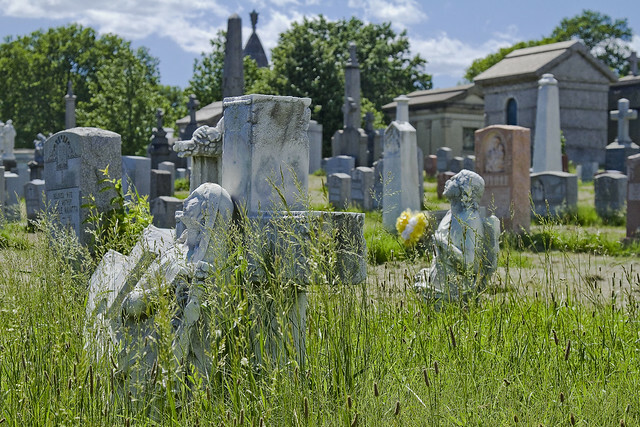 His forebears had stored away a copy of the burial and business records of Calvary Cemetery, a singular item since the original documents possessed by the Church were immolated in an outwardly suspicious fire. Insisting that our meeting be privately attended yet in a public place is what led me to St. Patrick’s Old Cathedral in the first place, a seemingly natural location given the circumstances, and one that might provide certain literary symmetries if the story was later told. As is habitual for one like myself, an attempt was made at an early arrival, and when my appointee arrived- he was not alone nor was he unobserved. 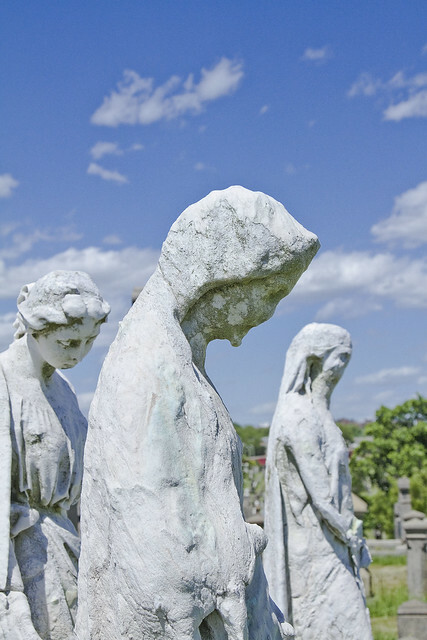 Calvary Cemetery began to be used August 4, 1848. The first interment was that of Esther Ennis. Sections 1, 2, 3, 4, and 5 had been previously blessed. No record is preserved, however, of the ceremony. Formerly, as is well known, every farm had its ” wood-lot” for fuel. The Alsop Farm had reserved 11 acres for this purpose, and the wood-lot has remained undisturbed to the present time. About 30 acres, lying in low ground near the water, were sold many years ago. 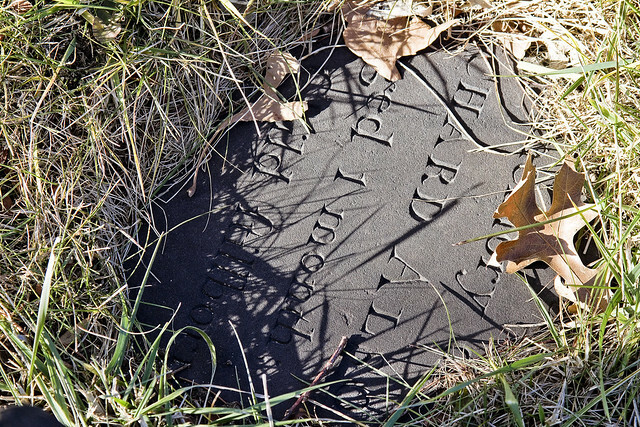 The remaining 73 95-100 acres of the original Alsop Farm were devoted to and are still used for cemetery purposes. It was the sight of his companions that shocked me into flight, as reported in the first post of this series, and I will confess to experiencing a sort of racism that has nothing to do with national origin or ethnicity having been kindled in me. Rather than ethnographic it was something ancestral and instinctual, a genetic memory of some other specie of intelligent ape which our wholesome ancestors saw fit to exterminate in some long ago savannah. I’m not altogether sure that these 2 companions of his were members of the “human race” itself, you see – with rounded jowls and underdeveloped chins they appeared to have a snout rather than a face- and what hung hairily beneath their wrists are better described as paws rather than hands. Their clothing was unseasonable and several years behind current fashions- flannel jackets and watch caps worn on a warm summer afternoon. The Anti Hibernian I was meant to meet did most of the talking in low whispers, and hoarse grunts were the only responses the two man shaped creatures offered in return which I could make out. The exact moment which brought on this latest surrender to “one of my states”, triggering a multiple hour flight which carried me across half of New York City in a foot blistering haze, happened when I was peeking out from behind one of the columns at St. Patrick’s Old Cathedral in the manner of some mouse who has just noticed the presence of predators. At present there are over five miles of flag walks in Calvary. 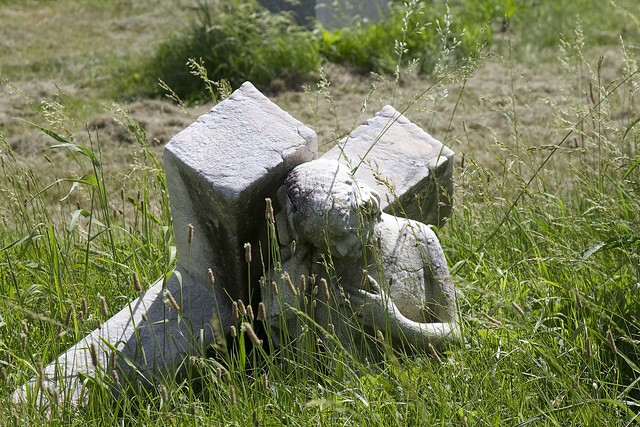 The cost of the headstones, monuments, etc., is roughly estimated as exceeding $6,000,000. A force of about 150 men is constantly occupied in attending to the burials, adapting and preparing the grounds for future use. 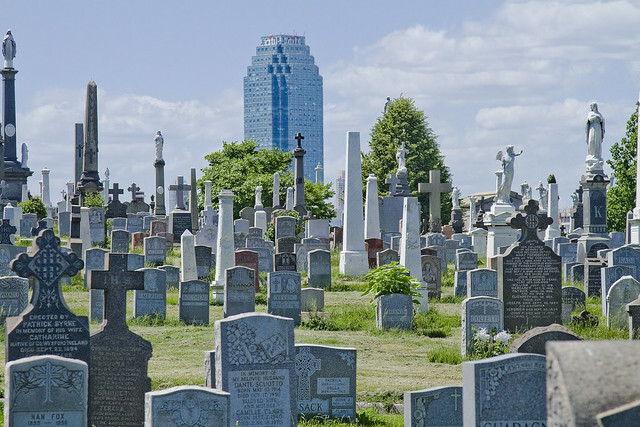 A characteristic feature of Calvary, as of all Catholic cemeteries in contradistinction to large burial corporations formed with a view to personal profit, is the provision made for the benefit of the poor and destitute. According to the direction of the ritual and the spirit of Christian charity, the needy are interred as a work of mercy. In fact, more than one tenth of all the burials are gratuitous. The entire number of interments since the opening of the cemetery in August, 1848, to January, 1898, is 644,761. Bits of it, like words on the tip of your tongue, are available to me as fragmented images lensed through the curious distortions of a migraine headache…. A metallic cylinder of some kind, the thickness of a young child’s index finger, passing between the man who contacted me and his conspirators. The odd juxtaposition of muddy workman boots worn under suit pants seemingly chosen to match the flower. The horrible countenance and bestial appearance of his companions, augmented by the jiggling folds produced where their jowled necks became occluded beneath shirt collar. The early history of Friends in Newtown and Maspeth Kills is marred by the irregularities of the Ranters, who claimed to be Friends, and intruded on their meetings. Such was Thomas Case, who (1674) was forbidden by the Court to entertain the wife of William “Smith. His wife, Mary Case, was fined £5 for interrupting Rev. William Leveridge, while preaching, by saying to him: “Come down, thou whited wall that feedest thyself and starvest the people.” Samuel Scudder sent a long, scandalous letter to Mr. Leveridge. I noticed that all three bore that unmistakable colour often commented on around the Newtown Creek, an iridescent hue which is neither black nor white nor any recognizable color of the wholesome earth, rather it is something alien- like a colour out of space. When one observes this colour, especially within the elite corridors and behind the mirrored shield wall of the Shining City of Manhattan itself, it is obvious that something from the tainted Creeklands is nearby. Mr. Wandell, according to reminiscence in the Alsop family, had been a major in Cromwell’s army ; but, having some dispute with the protector, was obliged to flee for safety, first to Holland, and thence to America. But some doubt of this may be justly entertained; because Mr. Wandell was living at Mespat Kills in 1648, which was prior to the execution of King Charles, and when Cromwell enjoyed but a subordinate command in the parliamentary army. Mr. Wandell m. the widow of Wm. Herrick, whose plantation on Newtown Creek, (originally patented to Richard Brutnell,) he bought in 1659, afterwards adding to it fifty acres, for which Richard Colefax had obtained a patent in 1652. On this property, since composing the Alsop farm, Mr. Wandell resided. He was selected, in 1665, as one of the jury for the trial of Ralph Hall and his wife for witchcraft, (the only trial for witchery in this colony,) and shared the honor of acquitting the accused. Some years later, he made a voyage to England, returning by way of Barbadoes, and, it is supposed, brought with him from England his sister’s son, Richard Alsop, who, about this time, came to America, and was adopted by Mr. Wandell as his heir, he having no issue. He d. in 1691, and was interred on the hill occupied by the Alsop cemetery. Many years after his death, the silver plate of his cofiin was discovered, in digging a new grave. That malign and impossible intelligence which cannot possibly exist in the crown of this “Sapphire Megalith of the Long Island“, a thing which neither thinks nor breathes but instead hungers, gazing down on the folly of knowing the past and chuckling deeply (it does laugh, I am told). Protected and coddled by its mercenary army of human acolytes, it must wonder “what profit can there be in these pursuits?”. And in the deep past- hidden behind the orthodoxy of 20th century historians- are found hidden references to Hannah Alsop (widow of Richard) having hosted meetings of so called “Friends” (Quakers in modernity) on the Alsop plantation. A nameless cult of some kind, these apostates are remembered only by their presence along Newtown Creek, troublemaking further east on Long Island, and by the colloquial name of “Case’s Crew”. There had scarce been any profession of the christian religion among the people of that town. They had scarcely any notion of religion but Quakerism. The Quakers had formerly a meeting there; but many of them became followers of Tho’s. Case, and were called ‘Case’s Crew,’ who set up a new sort of Quakerism, and among other vile principles, condemned marriage and said it was of the Devil, perverting that text of Scripture. ‘The children of the resurrection neither marry nor are given in marriage,’ and they said ‘they were the children of the resurrection.